I first visited The Great Wall a few months ago and haven't been able to forget the delicious sweet corn soup with chicken that I enjoyed there. I dropped by recently for a quick lunch and had to forego the soup as I was tempted by the lunch menu. 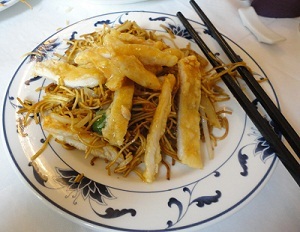 This consists of a choice of main dishes with rice or noodles on the side. I wasn't disappointed with the lemon chicken: strips of chicken breast in a delicate, tangy, lemon sauce, attractively garnished with lemon 'butterflies'. I was too hungry and greedy to photograph the chicken before I mixed it with the noodles and beansprouts, so you'll just have to accept my word for the presentation. The lunch-time specials are excellent value for £7.90, and are just enough to plug that lunch time gap, without being too filling. The service is prompt, helpful and friendly too. Of course you could pick more dishes from the menu, or return with friends for dinner in the evening. As well as meat and fish based dishes, there is also a generous choice of vegetarian dishes. The Great Wall is a family restaurant that has been satisfying the appetites of people in the London Bridge area since 1994. Despite its large size it was full of diners when I visited. These seemed to include business people, shoppers and large tables of office workers. From the outside it just appears to be a Victorian building and does nothing to betray the delicious food inside. It sits on the corner of Tooley and Bermondsey Streets, close to London Bridge station, and a short walk from Tower Bridge and the Queen's Walk alongside the Thames. From now until the end of the year you will probably have to find your way around the road works that are taking place in the street outside, but negotiating the obstacle course will be well worth it.